Hasselblad is known for its medium format camera, but it has now announced plans to release a APS-C camera system, the Hasselblad Lunar. The Lunar will be the first camera produced as part of a partnership between Hasselblad and Sony, and as such will feature a lot of the tech we've previously seen in the NEX series. A APS-C 24.3 MP sensor will be used with 25AF points focusing, and matched to an Ultra fast Processor. On the rear there will be a 3" high definition display and revolutionary OLED viewfinder. But possibly the most interesting thing about the Lunar (other than the price difference between it and the Sony Nex 7) is the materials being used - carbon fiber, titanium, wood, leather and precious metals - including gold. 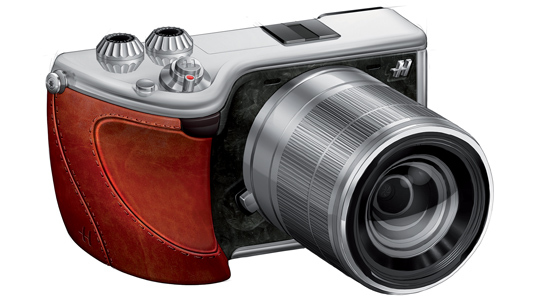 "The Lunar embraces the traditional Hasselblad state-of-the-art image capture combined with stunning Italian design features.